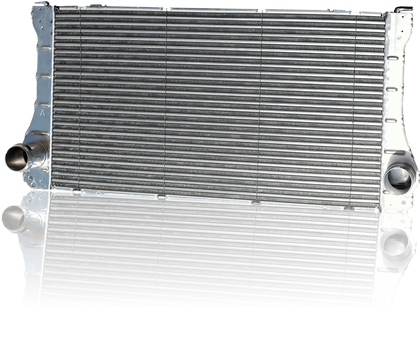 Intercoolers increase the efficiency of the intake air system by reducing temperature of heated air by the turbocharger (or supercharger) promoting more thorough combustion. This removes the heat of compression (temperature rise) that occurs in any gas when its pressure is raised or its unit mass per unit volume (density) is increased. A decrease of intake charge air temperature allows a denser intake charge into the engine, as a result of forced induction. The lowering of the intake charge air temperature also eliminates the danger of pre-detonation (knock) of the fuel/air charge prior to timed spark ignition. This preserves the benefits of more fuel/air burn per engine cycle, increasing the output of the engine.